Situated on the north side of the Yellowstone River and named after Frederick Billings, Billings was born in 1882 as a rail hub. It was first founded by the Northern Pacific Railroad on a site originally known as Clark’s Fork Bottom. Montana Avenue sprang to life along the railroad. The railroad was the heartbeat of Billings as it grew. The Northern Pacific, Great Northern, Chicago, and Burlington & Quincy railroad companies made regular stops on Montana Avenue. Fires were a constant danger in in any of the small towns on the prairie. In July of 1883, the entire block of Montana Avenue between 26th and 27th streets burned to the ground. 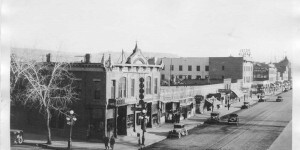 In 1885, a fire broke out in the Farmer’s Hotel along the north side of Montana, taking out a dozen buildings including the offices of the Billings Gazette. Improvements were made, yet in 1890, the town’s first hotel, the Headquarters Hotel on 28th Street North and Montana, burned along with the old depot and telegraph office. Resilient business owners and townspeople rebuilt soon after. Bottling works and breweries were always a part of Billings history. In March 1899, the Billings Brewery opened across from the Northern Pacific depot on Montana. Several small hotels were built during the second decade of the 20th century. The Eagle, McCormick, Rex, Lincoln and Carlin are among those that still remain. The sturdy brick buildings along Montana Avenue still hold much of their charm with architectural accents from years gone by. 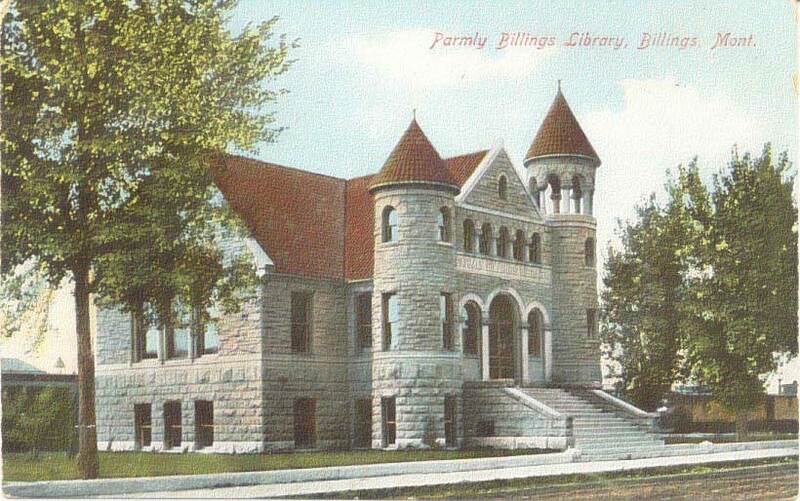 Parmly Billings Memorial Library in the 2800 block of Montana Avenue. 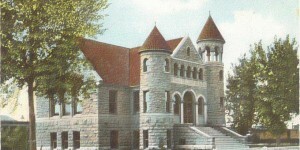 One of the first buildings on Montana Avenue to be built (in 1901) with its back to the tracks. Up to that point, the businesses on Montana Avenue faced across the tracks to the face of the businesses on Minnesota Avenue. 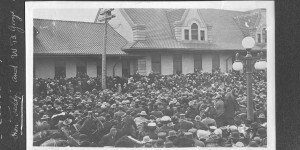 Ex-President Teddy Roosevelt speaks to a crowd at the Union Railroad Depot, April, 1911. 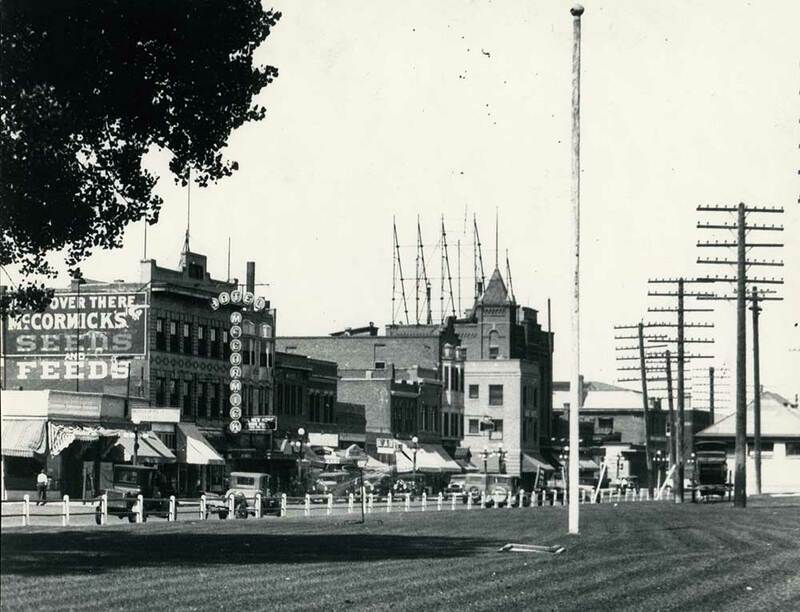 2500 block of Montana Avenue with Carlin Hotel in the early 1920s. The trolley tracks were used during the 1912-1916 period. The Commercial Hotel, in the foreground, was torn down in 1967. 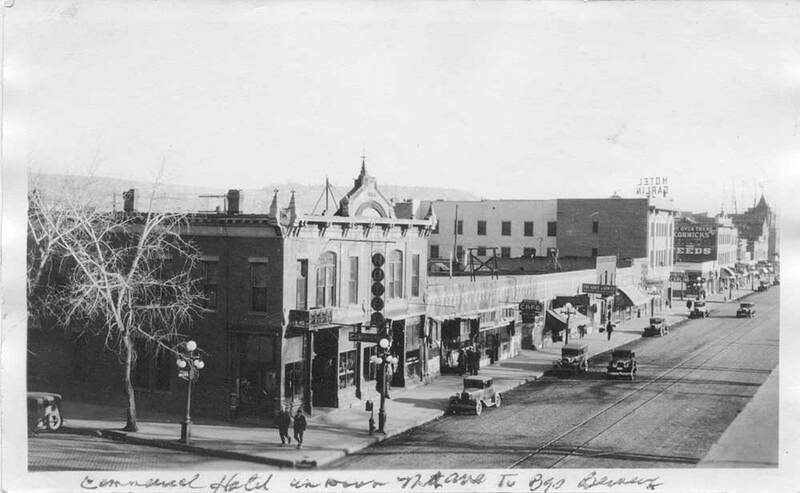 2500 block of Montana Avenue with Carlin Hotel in the early 1920s. The trolley tracks were used during the 1912-1916 period. 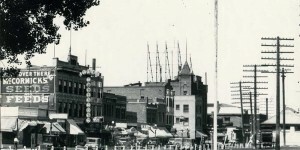 The Commercial Hotel, in the foreground, was torn down in 1967.